If you skip along to the Canon Creative Park website you can download a couple of new models by yours truly. 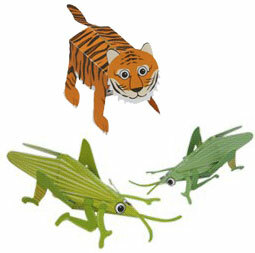 The Tiger and Grasshopper models are both snap-ups. They have an elastic band inside them. Fold them flat and when they are released they jump up. Fun! You may remember that I had mentioned these models on Workshop Notes before. Canon asked me to remove the entires until the models were released. They are now available so I’m off into the archives to republish. Woo hoo! Got ’em! Thanks for point them out. They look a treat! Thanks both. I hope you enjoy them! What jolly fun! I collect tiger things and the silly grins on these ones’ faces make a refreshing change from all the Noble Beasts there are around! And, to quote the Great Steve Jobs, one more thing! I’m very pleased they have taken your designs into the Canon Creative site; I’ve known about it for ages. For sheer loony enthusiasm and commitment it’s one of the best sites on the web: everything they put on there is of the very highest class in paper models, and there are some incredible models there. I hope this works really well to both your advantages – it’s almost like being given Royal Approval for biscuits (or whatever)! Royal Approval! I like it! Royal Approval! I like it! Maybe I shuld print a little canon with crown insignia on the side of the kits.